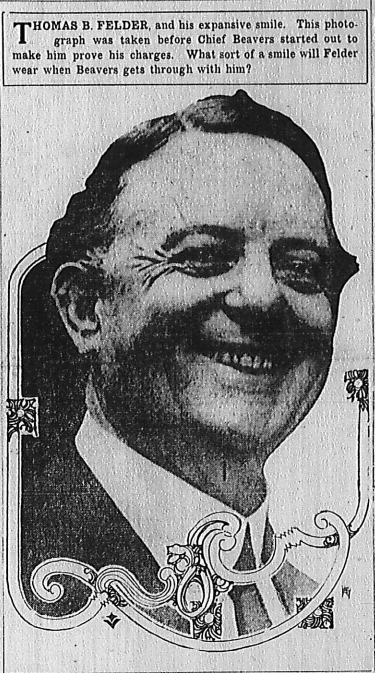 Thomas B. Felder, and his expansive smile. This photograph was taken before Chief Beavers started out to make him prove his charges. What sort of a smile will Felder wear when Beavers gets through with him? Chief of Police Beavers and Chief of Detectives Lanford both stated emphatically Monday that they intended to go to the full limit of the law in making Thomas B. Felder prove his charges of graft in the police department. Both Beavers and Lanford will take the matter before the Grand Jury, and they will take other action in the courts against Felder forthwith. Chief Beavers shortly before noon held a conference with City Attorney Mayson, after which he announced that he would take the whole matter of alleged attempted bribery and “conspiracy against him” before the Grand Jury next Friday. The chief was advised by the City Attorney that this was the proper course to pursue. He declined to specifically name all of those who will be involved, remarking that he will lay all of his evidence before the grand jurors and ask indictments. They do not intend to let Felder’s statements go with a simple newspaper denial made by them. They intend to have a thorough investigation, and they intend further to make Felder come forward with his evidence or take the consequences; and the consequences, they intend, shall be the fullest penalty that the law can inflict upon him. Both Beavers and Lanford have determined to go at the matter systematically, thoroughly and in a legal way; and they intend that the investigations before the Grand Jury and in the courts will lay bare all the “secrets” that Felder is alleged to have of bribery and graft in the police department; and also make public the reasons Mayor Woodward has in the attempt to restore the restricted vice district in Atlanta. It is regarded as certain that Felder is eliminated entirely from the Phagan case. It had been believed that he really was in the employ of the Frank defense up to the time that he began to bombard the public with statements against Frank and went on record in saying he believed in the guilt of Frank. In making this statement, saying he believed in the guilt of Frank, he takes the same position as that of Lanford and Beavers, who are also convinced of Frank’s guilt. Felder, therefore, can not appear as an attorney for Frank, nor is he wanted by the prosecution as an attorney to aid in prosecuting the case. It would seem, therefore, that he has not standing in the Phagan matter at all. Both Beavers and Lanford state positively that the evidence collcted by the police department in the Phagan case points to Frank’s guilt, and that all the evidence collected by the Burns Agency and the Pinkerton Agency simply confirm that belief. They said that no new evidence, not already secured by the city detectives, was produced by either Burns or the Pinkerton men. Mayor Woodward to-day issued a statement denying Chief Beavers’ assertion that he was eager for the restoration of the restricted district and declaring that if Beavers and Chief Lanford framed the dictograph plot they were unfit to hold office and should be ousted.